Savella (milnacipran HCI) is a prescription drug that is in a class of medications known as selective serotonin and norepinephrine reuptake inhibitors, or SNRIs. Savella is used to increase the amount and effectiveness of neurotransmitters such as serotonin and norepinephrine, which are used to communicate between brain cells. Savella (milnacipran) prescribed by your doctor is a laboratory-synthesized form of these neurotransmitters. 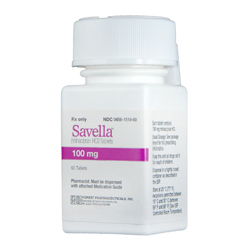 Savella comes in a tablet form that is taken orally, usually twice per day. Milnacipran medications may be taken with or without food; taking the drug with food may reduce the occurrence of common Savella side effects, such as nausea. For best results, always take Savella exactly as directed by your doctor and at the same time each day. The Food and Drug Administration approved Savella (milnacipran) for the treatment of fibromyalgia in 2009. Savella works best for fibromyalgia patients age 18 and older; it is not usually recommended for children or young teenagers. In clinical trials completed before the drug received FDA approval, a large number of patients using Savella reported a 30 percent or greater reduction in the severity or occurrence of fibromyalgia-related conditions such as chronic pain, fatigue, muscle stiffness and tiredness, and difficulty falling or staying asleep. Although the Food and Drug Administration has not approved Savella for the treatment of major depressive disorders, milnacipran has been used to treat depression in French patients since 1996. In fact, milnacipran is used as an antidepressant in more than 45 countries around the world, including Finland, Japan, France, Austria, Bulgaria, Mexico, Portugal and Russia. Only time, and further clinical trials, will tell whether the FDA will approve milnacipran as a treatment for depression and other mood disorders in American patients. Patients are started on a low dose of Savella, and based on their reactions to the medication, the dose can be increased during the first week of treatment. Some patients have reported pain reduction in as little as the first week of stable doses; however, it can take several weeks to feel the beneficial effects of Savella. Patients should continue taking the prescribed dose even if they do not experience immediate improvement. Savella also carries the same risks as antidepressant medications. Savella is not approved for individuals under the age of 18 because of the increased risk of suicidal thoughts or actions in children, teenagers, and young adults. Patients on Savella should alert their doctor if they experience unusual changes in behavior, suicidal thoughts, anxiety, agitation, panic attacks, difficulty sleeping, irritability, hostility, aggressiveness, impulsivity, restlessness, or extreme hyperactivity. You should not take Savella if you are currently taking or have recently taken a monoamine oxidase inhibitor (MAOI) or have uncontrolled narrow-angle glaucoma. Before taking Savella, you should tell your healthcare provider if you have hypertension, heart rhythm problems, any heart diseases, liver problems, substantial alcohol use, kidney problems, manic episodes, seizure disorders, bleeding disorders, or glaucoma. Also tell your doctor if you are taking medication for a psychiatric or neurological condition, NSAID pain relievers, aspirin, warfarin, blood thinners, or diuretics. Savella is a viable option for any individuals suffering from Fibromyalgia. If you feel that Savella could help relieve your chronic pain, talk to your doctor to see if Savella is right for you.